The Breville BPR200 is an excellent cooker and features a stylish design. It is perfect for cooking your favourite meats. Working professionals love putting something in the cooker before work and coming home to a delicious meal. The Breville BPR200 makes life easier. Enjoy the safety features and that it can easily be programmed. Use it when you have family over for dinner. Your mom will be impressed with how well you cook and she won't be disappointed in the taste either. Cooking options include Pressure Cook, Slow Cook, Saute, and Sear & Steam. They provide many choices when it comes to cooking. Anyone looking to save time will love the Breville BPR200. It was designed to make cooking easier. This device is perfect for preparing a meal in the morning. When you come home it will be ready. There is a lid that retains steam and builds pressure to cook your meal faster. You can also take the Breville BPR200 with you when camping or to your hunting camp. This appliance delivers everything that you could expect. 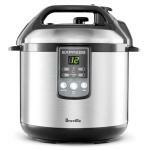 The Breville BPR200 can double as a pressure cooker and a slow cooker. Plus, it can be used as a steamer when needed. One feature is its stainless steel basket. You also get a serving spoon and a heat resistant spatula. The best part is that it is easy to use. Try out the intuitive touch controls and the easy to read digital display. You won't have any trouble putting it together. Plus, it is easy to clean, thanks to the non-stick bowl. The stainless steel exterior does require some attention. Anyone looking for an excellent cooker will love the Breville BPR200. It is efficient and gets the job done. Most people love the fact that it will save them time. Take advantage of all the features that comes with it to prepare your favourite meal. This is one unit that you won't want to live without. This device is perfect for individuals without a lot of time, plus it's very reasonably priced for an appliance that offers four functions in one.